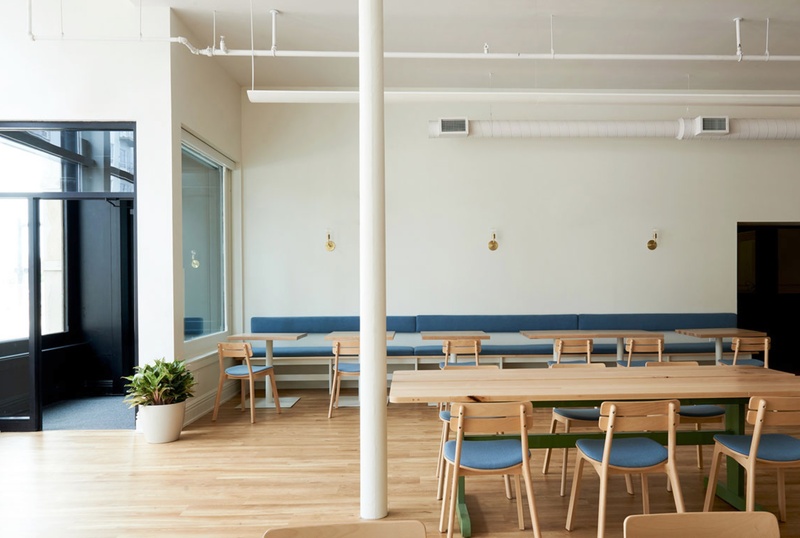 Now serving: stylish coworking spaces served with a side of hospitality. 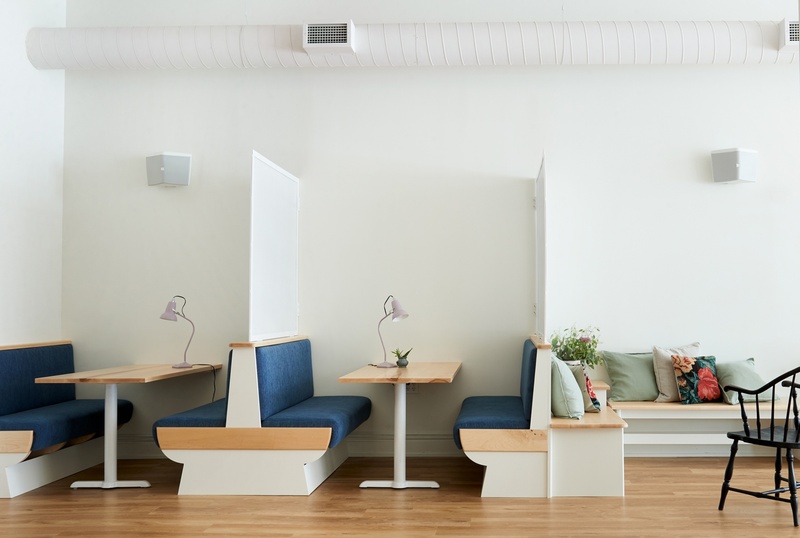 Enter Beauty Shoppe, a Pittsburgh-based coworking operator on a mission to make neighborhoods and coworking spaces more hospitable and welcoming. Beauty Shoppe was founded by Rabih Helou and Zach Ciccone in 2010. Unhappy with the coworking space options, they forged their own brand. They rented an old building in downtown Pittsburgh--one with “Beauty Shoppe” written on the building--and decided to keep the name. But with delightfully designed coworking brands popping up on every downtown corner, what makes Beauty Shoppe different? Take their latest Beauty Shoppe spot, Foyer. Foyer is a cafe located in the Ohio City neighborhood of Cleveland. This historic limestone beauty is a part of the “$60 million neighborhood renovation,” aiming to revitalize this part of downtown Cleveland. But unlike WeWork or The Wing, Beauty Shoppe built the attached Foyer to be available to the public. Foyer is Beauty Shoppe’s “first foray into food & beverage operations,” said food and beverage director Wes Shonk. And if you think about it, the cafe and workspace are a natural pair. Other Beauty Shoppe coworking spaces also include retail stores, furthering the idea of merging public space with coworking environments. 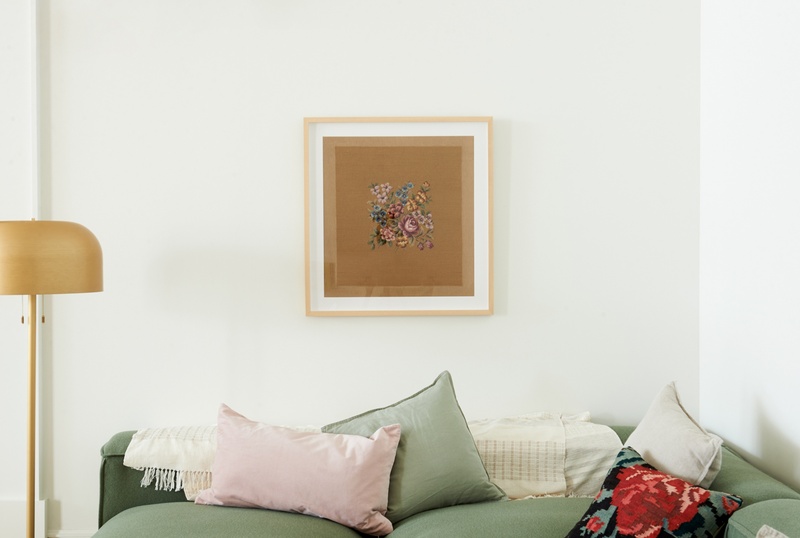 Designed by Stewart and her team, Foyer is airy and gorgeous, featuring bright white walls accented with natural woods and warm, sweeping textiles and paint. 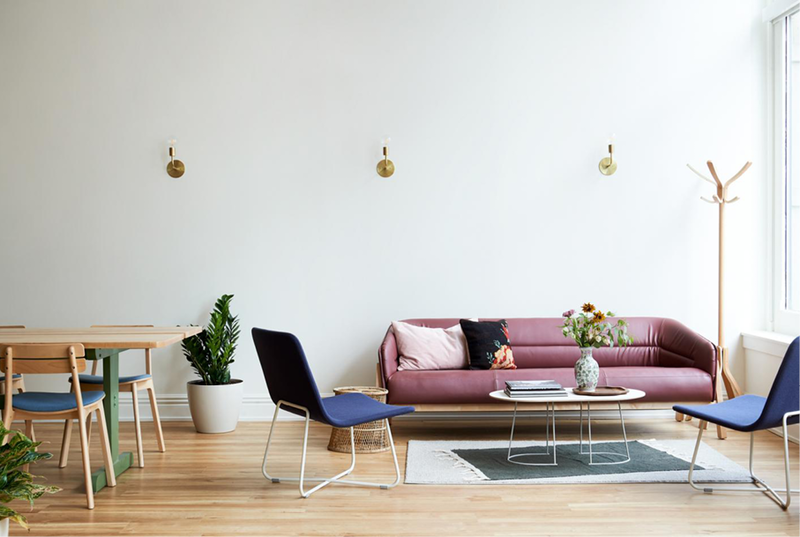 Located on the ground floor of the Seymour, the space is multi-functional, offering nooks and crannies for work and leisure. Stewart and her team also made it a point to use as many local vendors and manufacturers as possible. They have modern cafe furniture, booths, and a gorgeous flex area featuring a pink couch and blue Harper X-Base Lounges. Aside from the stunning, soft color story, perhaps my favorite aspect of the design is the story. 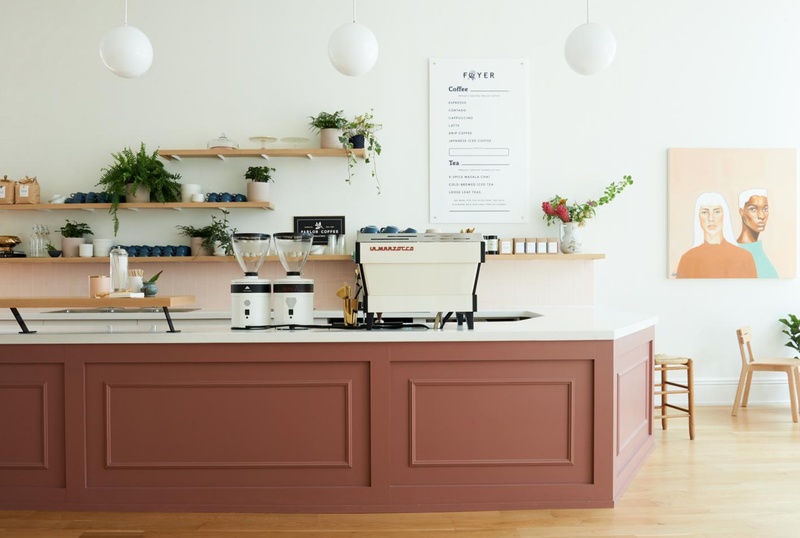 Instead of opting for the trendiest cafe design, Stewart paid homage to the building’s history. During my interview with Stewart (coming soon! ), what stood out was Beauty Shoppe’s astute awareness of community. 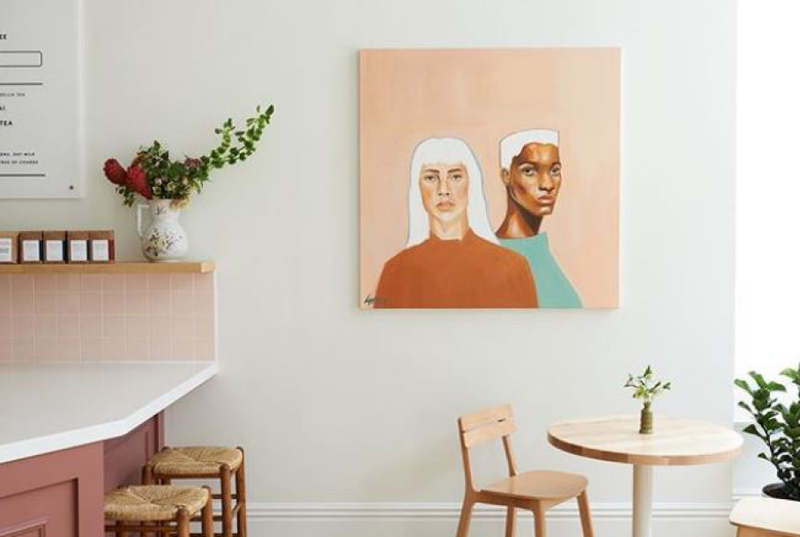 While many coworking brands choose to build community within their own four walls, Beauty Shoppe is offering a different approach by lending a hand (and space) to their entire community.